Acquisition Donated to the CFA Foundation, September 2014. Miss Ethel B. 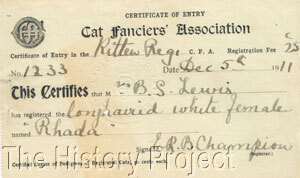 Champion was the first Registrar for the newly formed Cat Fanciers' Association in 1906. She served in that capacity until 1917, when she left CFA. In 1919, she was a driving force in the formation of a new organization, the United Cat Fanciers' Association, which eventually became the Cat Fanciers Federation (CFF). Miss Champion's mother was well-known as the importer of Lord Sylvester who, in 1899, was identified as the most perfect in coloring of any Masked Silver Persian ever bred. 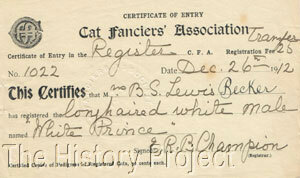 Top left: Registration slip, #1022, for 'White Prince' a "longhaired white male". Owner is Mrs. B. Lewis. The registration is dated Dec.10, 1910 and the registration fee was 25 cents. Top right: A Transfer of ownership, dated Dec.26.1912 for 'White Prince' adding "Becker" to the name of Mrs. B.S. Lewis. The transfer fee was 25 cents. Bottom left: Registration slip, #1233, for 'Rhada' a longhaired white female. Owner is Mrs. B.S. Lewis. The registration is dated Dec.5.1911 and the registration fee remained at 25 cents. 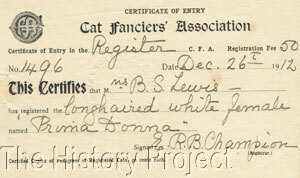 Bottom right: Registration slip, #1496, for 'Prima Donna' a longhaired white female. Owner is Mrs. B.S. Lewis. The registration is dated Dec.26.1912 and the registration fee had increased to 50 cents. Little is known about 'White Prince', a blue-eyed white male, other than he was a son of Champion Famo x Prima Donna. It's interesting that Prima Donna was registered with CFA two years after White Prince. From pedigrees in the CFA Foundation's Feline Historical Museum, we also know that White Prince was offered at stud to Mrs. Wm. H. Town's silver tabby, 'Betty', that resulted in a litter born on Dec.11.1914. Of 'Prima Donna', we know that she was ill with a respiratory problem in April of 1911 and required medication for treatment. Diagnosis and prescription was from Dr. Maffitt Smith, a canine specialist veterinarian, and medication was dispensed by Hegeman & Co, Chemists & Druggists, New York City. The CFA Foundation owns a series of letters, dated May and June 1914, between Mrs. Becker and Delta Connelly, Sandalphon cattery, regarding the breeding of Prima Donna to 'Champion Shiraz', an imported blue Persian male. We know that 'Rhada' was shown, and was an entry, Pen No. 36, in Class No. 90 at the Atlantic Cat Club show held at Madison Square Garden, December, 1911. 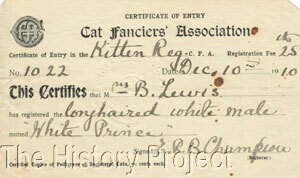 From an Exhibitor's Ticket, we know that Mrs. B. Lewis also attended the Atlantic Cat Club show in December 28-30, 1910. As Mrs. Becker, she became a member of the Empire Cat Cub in February, 1914, and records indicate that she remained a member at least through 1920. She was also a member of the New York Women's League for Animals.